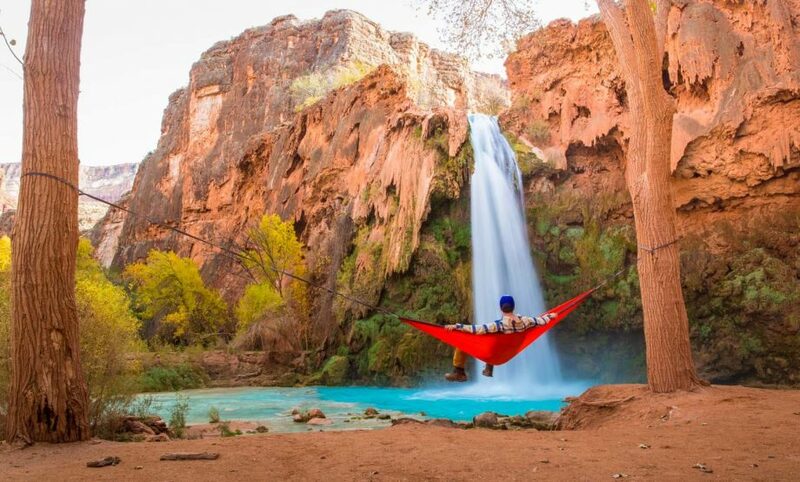 Havasu Falls backpacking is an adventure you have to do at least once in your lifetime. 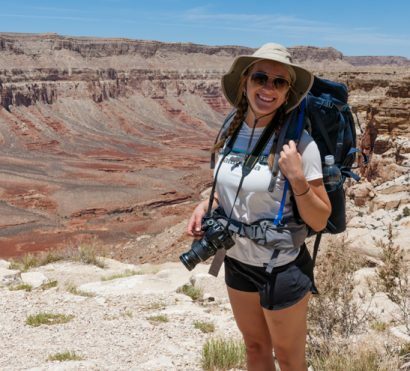 Disconnect from our busy, materialistic world and rely only on yourself, the experience of your professional guide, and the gear you carry on your back as you trek to some of the most incredible waterfalls the Grand Canyon and Arizona have to offer. Backpacking is the most strenuous way to visit Havasu Falls. You will carry all of your gear including tents, sleeping bags/pads, food, and even group gear like the kitchen equipment which will be shared among hikers. 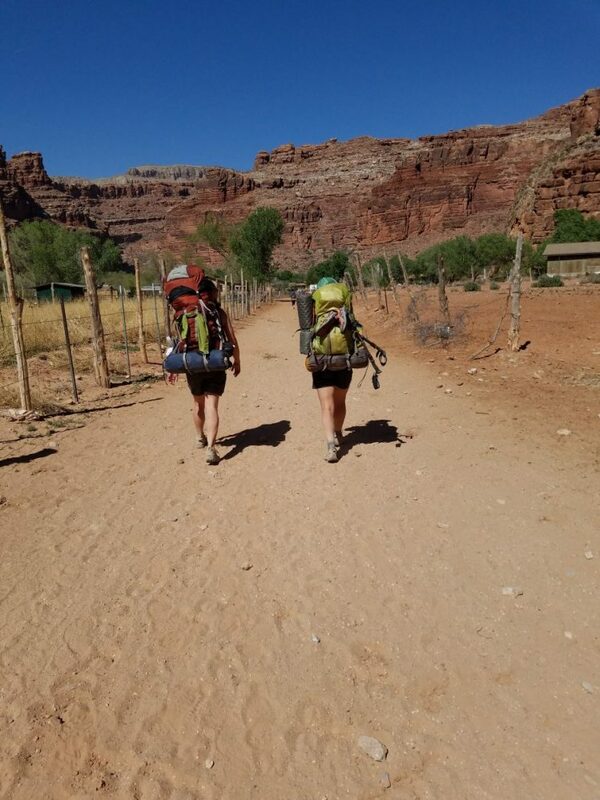 You must be comfortable carrying 35-45lbs during the (10 mile) hike in and out of the canyon through the village of Supai. Don’t have the gear? AOA has all the gear you’ll need available to rent for the trip. Ground transportation from Host Hotel in Scottsdale/Phoenix area to Grand Canyon Caverns campground on Day 1. Ground transportation from Trailhead back to Host Hotel on Day 4 (ETA 3:00-5:00pm). Bottled water and snacks during transfer. Optional upgrades, additions, and rentals subject to tax (7.95%). We will be offering a comprehensive outfitting package. Get your own permit, rent your gear from AOA, then go self-guided! 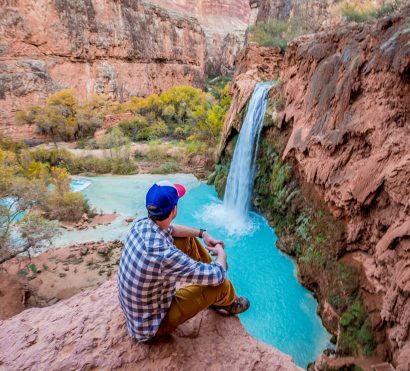 This tough yet rewarding Havasu Falls backpacking itinerary takes you to the best views of Grand Canyon's famous azure-blue waterfalls. Your guide will lead you through this beautiful and unique section of the Grand Canyon over 4 days. Carry all you need to explore Havasu Canyon on your back, discover how the canyon was formed, and the legends of the Havasupai people who call it home today. You’ll sleep under the stars and enjoy delicious backcountry meals prepared by your guide while you soak your feet in the refreshing waters of Havasu Creek. Trip End: Finishes at the Havasupai Trailhead between 11am-2 pm on day 4. See Upgrades + Additions for optional transportation from Scottsdale, AZ. 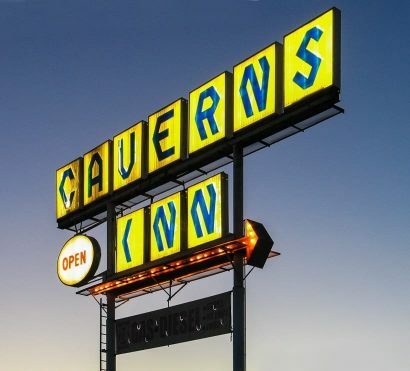 Grand Canyon Caverns is a remote motel and campground located on Historic Route 66 about 1 hour from the Havasupai Trailhead. Here we meet for dinner and an orientation from our guide. We’ll distribute any rental gear (tents, sleeping pads, sleeping bags, etc), and get our backpacks fitted and packed before our big hike tomorrow. After setting up your tents for a night under the stars, a campfire and amazing guide-prepared meal will await. We’ll enjoy some frontcountry aspects of this established campground (flush toilets and hot showers) before venturing deep into the Grand Canyon tomorrow. Backpacking is a shared experience that builds camaraderie and friendships in a unique way. Spend the evening getting to know your fellow travelers, tomorrow you toil together and relax together in the heart of the Havasupai waterfalls. Your backpacking trip begins today at 5,200 feet in elevation and descends 10 miles into the Grand Canyon. All of your training will lead up to this day. Be prepared to stretch your legs and be rewarded with astounding canyon views around every turn and some of Arizona’s most beautiful waterfalls. The trail to Havasupai switchbacks down until it reaches a dry streambed and levels out. After a trailside lunch, the canyon walls seem to grow taller alongside the trail as you descend deeper into the labyrinthine red sandstone of Hualapai Canyon. At mile 8, the canyon begins to widen and the vegetation turns lush as you get your first glimpse of Havasu Creek and enter the village of Supai, the most remote village in the U.S. where even the mail still arrives by packhorse. Here at 3,200 feet, after a welcome rest stop, the Cottonwood-lined paths will lead you through the village and into the canyon’s backcountry. A little further down the trail, you hike past 70ft. New Navajo Falls, 35 ft. Rock Falls and 100 ft. Havasu Falls. From there your group will explore the campground and find the perfect spot to call home. Estimated arrival time is between 4:00pm and 6:00pm. The reward for our 10-mile hike is a hearty and delicious guide-prepared dinner, served under the stars before we retire to our cozy tents for the night. 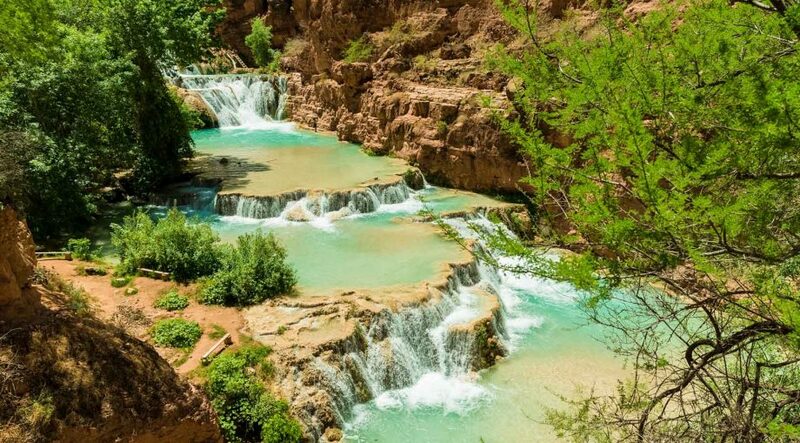 DAY 3: Adventure in the "Gem of the Grand Canyon"
Awaken in camp, nestled beneath the towering cottonwood trees along the banks of Havasu Creek and a short walk from the canyon’s enormous waterfalls. You will find coffee and breakfast each morning before you and your guides set out for hikes around Havasupai. Cross tropical blue streams and wade through lush meadows of wild grapevines. Clamber up narrow side canyons with red rock walls towering thousands of feet overhead. Even take a swim beside a 200 ft. waterfall. Each day you will dine on healthy, hearty meals prepared by your trip leaders. 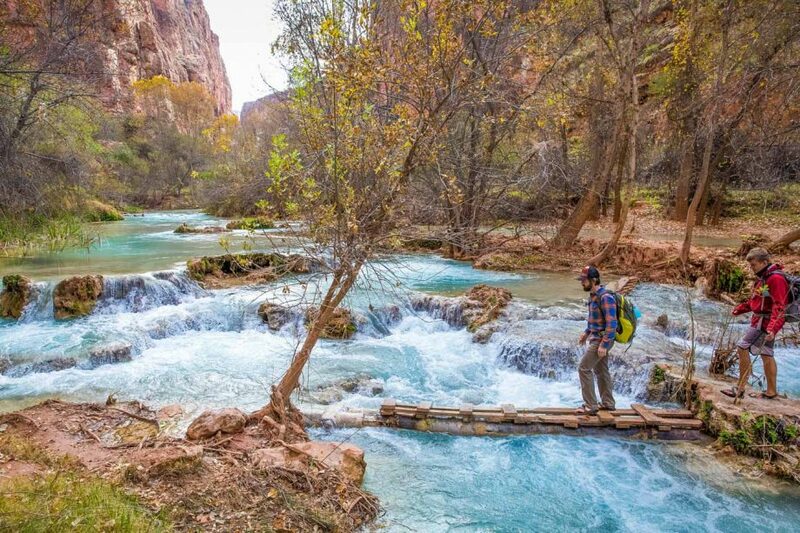 All the guided hikes are optional, and you are welcome to choose to instead spend a lazy afternoon or morning relaxing by Havasu creek. Remember, it’s your vacation. Make it what you wish. We have options from high adventure to peaceful relaxation. The scenery and magic of Havasupai and its majestic waterfalls will make you never want to leave, but after breakfast it is time to conquer the canyon! While always challenging, the exhilaration of reaching the rim is an amazing feeling you will never forget as you leave the blue-green waters of Havasu Creek and Falls behind. 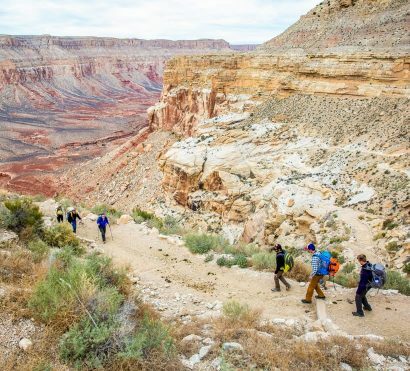 Hiking out of the Grand Canyon is a strenuous endeavor, especially on any backpacking trip. Remember, you will be carrying a large and heavy backpacking pack. This is the goal you should prepare yourself for most. Expect to arrive at the rim between 11:00am – 2:00pm. Cell service: This area has very limited cell phone service, you should expect to be unreachable by phone. There is no electricity available. Bring a portable battery to charge your phone for photos. Bathrooms/Showers: The campground has outhouses that use a unique composting system that keeps them quite clean. However, when wind blows we can sometimes smell them in camp. 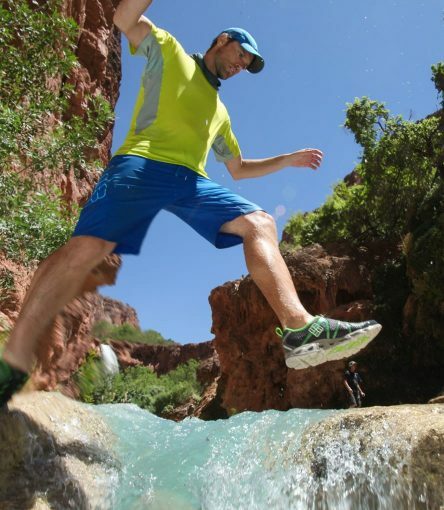 There are no shower facilities available, so our guides will explain how to use Leave No Trace practices to take a shower using water from Havasu Creek and the solar shower provided by AOA. This backpacking trip requires you carry all you need and a portion of the group gear on your back during the hike in and out of the canyon. Expect to carry 35-50lbs. Because we carry all food for the trip in our packs, we will be eating freeze-dried backpacking meals on this trip. Don’t worry, our guides are whizzes at doctoring them up into a delicious hearty spread. Some of the dates for this trip take place during the heat of the summer, so it’s important to start hiking very early in the day. The first and last hiking days you may need to begin hiking in the dark. Your guide will need your help setting up and tearing down camp.